Initially, the ContiMine™ range comprises 28 tyres, which will be launched throughout 2017. In the meantime, additional customer requirements will be evaluated which may lead to a further portfolio extension. 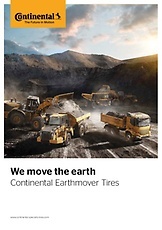 The tyres were specifically designed for the extreme conditions our customers are facing in the earthmoving sector. manual checks and optimising the life of your tyres.